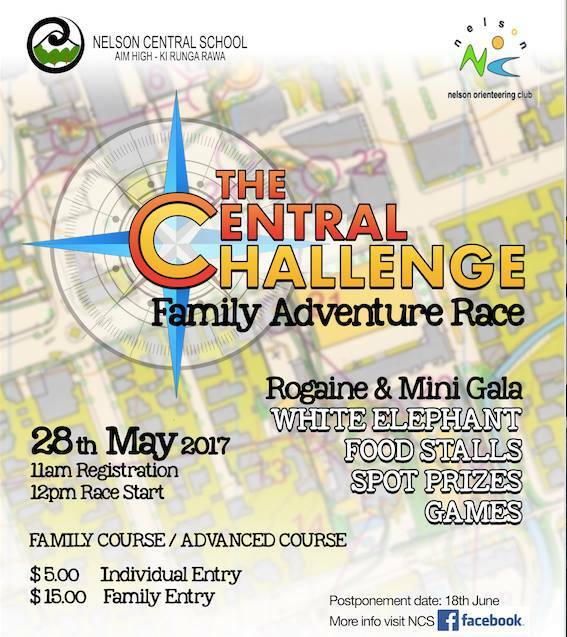 Forget about cake stalls and Jumble sales- Nelson Central School has come up with a new idea for fundraising that promises to offer exercise, teamwork and a whole lot of fun. 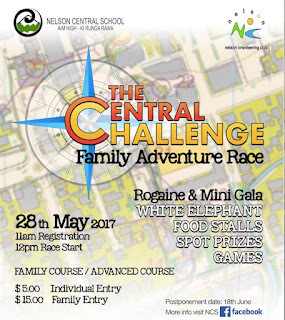 The Central challenge is a Rogaine and Mini Gala. It will be a day packed with family fun, spot prizes, stalls, games and activities. The main event is the first ever Central Challenge Rogaine. * Participants get a map and questions. * Each Question has a number which relates to a point on the map. * You need to visit the locations and answer as many questions as possible in the time allowed. * Points are taken off for every minute you go over time and for incorrect answers. * The Aim is to find as many answers as you can before time runs out. There are two courses: one designed for fun with families and younger children and a more challenging course for children over 12 and experienced rogainers. After the challenge, spot prizes and raffles will be drawn. This is really a fun day out for families and a fun way to raise money: to build a Whare/ shelter for outdoor assemblies as we no longer have a school hall; for digital devices for class rooms and to help Te Pouahi to raise money for the Kapa Haka Nationals. Registration will be on the day from 11am.